"No other PC game has captured the feel of boxing as well as 4-D Boxing. The 3D engine in 4-D Boxing was not a gimmick; at the time, it truly was a whole new way to simulate boxing in a computer game. The camera wasn't fixed -- you could play through the eyes of your boxer, from ringside, from a fixed isometric view, overhead, whatever. You could even play through the eyes of your opponent. It's a real trip to stare yourself in the face as you beat "yourself" up. The moves were rotoscoped fairly well, leading to life-like movements, swings, hooks, and uppercuts. 4-D Boxing had a feel that no other computer boxing game has captured since, even 8 years after its release. 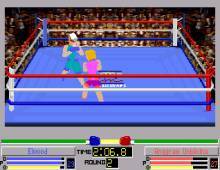 While there have been a few console boxing games that come close (including one for the 3DO that was heavily influenced by 4-D Boxing), nothing satisfies the need to box like 4-D Boxing. And it runs great on modern machines, so try to pick up a copy!"